it also says it is a Ruby ring which is the birthstone for July.... aww sweet..
Oh seeing those pix made me realize how much I've missed her. Is this an Action on Addiction event? I'm rather surprised she decided to go there and show off her figure, for some reason I thought she wouldn't wear fitting clothes and opt for keeping her belly to herself. Not that I'm complaining or criticizing her. It's so nice to see the Duchess out and about today. No hint of angst over her appearance and showing no jealousy toward other women ( ). Some might think it is quite the social horror that she is so well adjusted and happy, that she tries to do good rather than grousing about what is not. I, frankly, cannot understand that point of view. As if when we are all miserable, it is a better world. Slap on that lovely smile, Catherine and carry on. There is nothing of substance to criticize. BTW, do you think we'll see pics of her inside? Yeah, there are a bunch of photos from inside. You can definitely see the bump in this pic. She looks beautiful, more beautiful than before she was pregnant. She does look beautiful. Here's another photo. Another beautiful picture, thank you for sharing. I've never been pregnant so please forgive the ignorance of this question. At 19ish weeks, has she felt the baby move? If she hasn't felt the baby move already, she should soon. They say anywhere from 16-20 weeks is when you can feel the baby move. I felt my babies move at about 12-13 weeks - it's very faint but there. So she's feeling it even if she does not realize she feels it. Now that we've seen the bump, I predict 6 more weeks of winter! Stating such things is not how one wins friends. Thank you for the info about baby movement. Cannot even begin to imagine what that feels like, especially for the first time. I think this might be the loveliest I've ever seen her look. The slight fullness to her figure suits her beautifully and makes her look so young. I was thinking the same thing - I'm not sure she's ever looked better. The fullness of her face and figure certainly suit her. I was a bit surprised to see the "bump" already - I didn't know if she'd be showing yet, and even if she was, I thought she might have covered herself more. But it's so nice to see her looking so healthy (especially after the, well, bumpy start to her pregnancy), and confident as well. Victoria Murphy ‏@QueenVicMirror Kate acknowledged she is nervous about giving birth, said: "It would be unnatural if I wasn't." Catherine is very stunning, she is happy too. She is beautiful! Herczeg surname is in the very old hungarian traditional spelling, this is a word means prince. I'm sorry, if bad is my English. Now i learn English! Catherine looks lovely. I think she looks much healthier with a little extra weight on her. 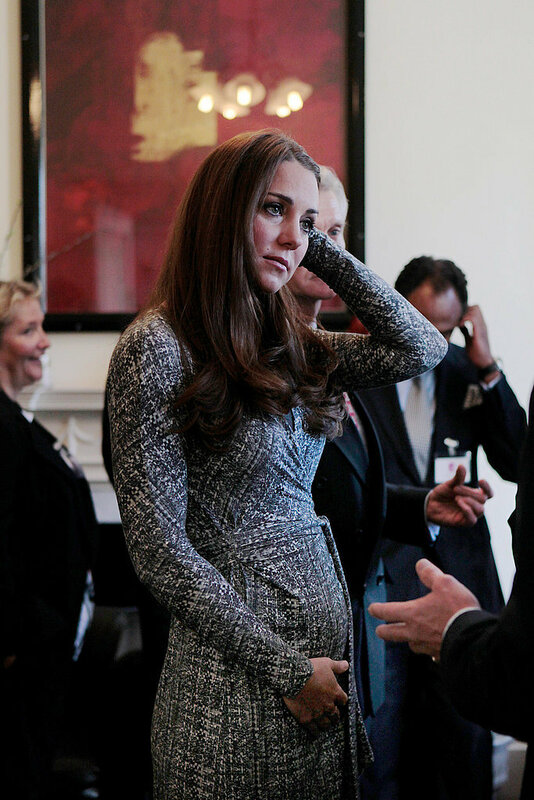 The baby bump is quite adorable. Good to see she is feeling better.